Prayer shawl ministries have been developed among TRUST congregations, and over one hundred prayer shawls are distributed yearly. 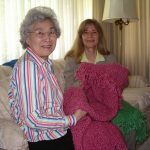 Through the Prayer Shawl ministry, compassion and the love of knitting or crocheting has been combined into a prayerful ministry and spiritual practice which reaches out to those in need of comfort and solace, as well as in celebration and joy. Many blessings are prayed into every shawl. The shawl maker begins with prayers and blessings for the recipient. The intentions are continued throughout the creation of the shawl. Upon completion, a final blessing is offered before the shawl is sent on its way. Some recipients have continued the kindness by making a shawl and passing it onto someone in need. Thus, the blessing ripples from person-to-person, with both the giver and receiver feeling the unconditional embrace of a sheltering God. To learn more about the history of the Prayer Shawl ministry visit the Prayer Shawl ministry home page.